I've neglected my blog for nearly two weeks, as I traveled to Maine and Boston for the holidays. I didn't have time to really investigate bicycling conditions in Boston, a city on the cusp of serious progress for bicycling thanks to a supportive Mayor Thomas M. Menino. 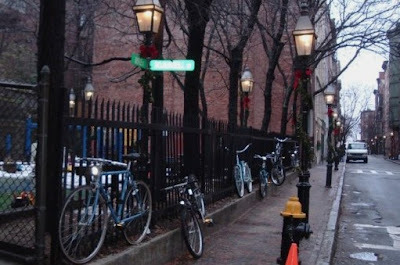 I enjoyed this whimsical bike rack in Brookline, as well as these bikes locked to a fence in my onetime neighborhood of Beacon Hill. I also had an opportunity to walk along the new Rose Fitzgerald Kennedy Greenway, created by the expensive burying of the Central Artery (Interstate 93). The infamous "Big Dig"--or what I like to call Tip O'Neill's parting gift to Boston--was declared officially "finished" this month after 16 years of disruptive construction. The elevated Central Artery was certainly an eyesore, one of the highway era's most criminal assaults on a city's life. The Big Dig "remedied" this foolishness by burying the roadway, becoming the most expensive highway project in U.S. history as its cost swelled far beyond the original $2.7 billion estimate to a final price of just under $14.8 billion (Graft? In Boston?!?). For that sum the Boston region could have created a world class transit and light rail system, and eliminated the need for any freeway. Boston is certainly much better without the elevated freeway blight. The city's waterfront is reconnected to downtown, and the new greenway is a welcome amenity for visitors and residents. And just as San Francisco's demolition of the Embarcadero Freeway attracted new waterfront development, new projects are springing up in the wake of I-93's undergrounding. Perhaps it's time for a national movement to roll back freeways and restore the vibrancy of urban life? Some members of Congress come to Washington and get in the fast lane. The 59-year-old (Earl) Blumenauer came to Washington and got in the bike lane. Few members of Congress care more than he does about cranks and sprockets. Mr. Blumenauer's "obsession with bicycling borders on the interesting," sniffed TV satirist Stephen Colbert. "Bikeman," a House colleague from Oregon calls him. Mr. Blumenauer owns seven bikes. His congressional office is one of the few -- if not the only one -- that didn't even apply for a parking permit. On occasion, Mr. Blumenauer has cycled to the White House. On Mr. Blumenauer's first visit, the Secret Service, more accustomed to limousines, was flummoxed at the sight of his bike. "I leaned it up against the portico," Mr. Blumenauer says. Mr. Blumenauer has been a pedal pusher since his days on the Portland City Council, when he pressed for more bike lanes and set an example by riding around in his suit and a big bow tie. When Mr. Blumenauer arrived in Washington in 1996, he didn't bring a car. 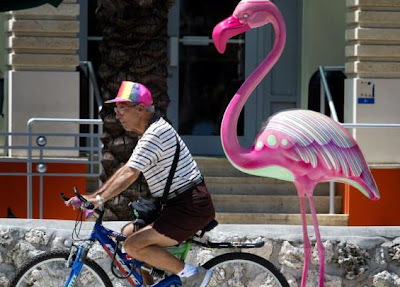 Soon he was preaching the benefits of pedaling. He launched the Congressional Bike Caucus, a bipartisan group that promotes public investment in cycling. In his early days, he tracked down Speaker Newt Gingrich in the House gym to pitch transit-fare subsidies for House workers. He got them. As the ranks of the Bicycle Caucus have grown -- there are now more than 170 members -- money for bike projects has grown, more than doubling during his time in office. We certainly need more people in Congress like Earl Blumenauer. The article also details Representative Blumenauer's unsuccessful efforts to date to pass the Bicycle Commuter Act, which would encourage employer benefits to bicycling employees, comparable to those received by workers who enjoy a "free" parking space or a discounted transit pass. Thanks to Bike Commute Tips Blog reader Jack Painter, for sending the link to this article. If you're still looking for holiday-shopping inspiration...this may be the year to consider bicycles. 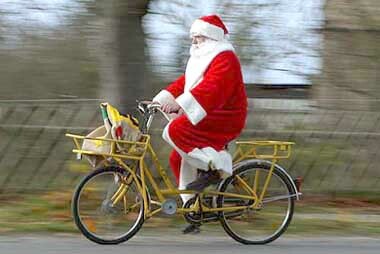 In the days before video game systems, a new bike was probably at the top of most lists that Santa Claus received from American kids. A new bike has long symbolized freedom and independence to kids, the way a new car symbolizes it to teens and adults. Bicycles today can also symbolize environmentalism, health and clean living. It is this newer view of bicycles that has inspired the Village of Homewood to create a bicycle plan. In 2006, the village commissioned the Chicagoland Bicycle Federation to create the plan, which proposes a bicycle network and defines a 10-year program to improve key components of the network that will make bicycling safer, more convenient and more fun in Homewood. The village's goal is to use the plan to develop a bicycle-friendly environment that encourages residents to bike for transportation, recreation and good health. The program is organized by short-term, mid-term and long-term recommendations. I can personally attest to the transformative power of a gift bicycle. As I describe on my Bike Commuting Tips site, my own recovery of bicycling--the gap being teenage drivers license acquisition until mid-30s--came as a result of a very thoughtful Winter Solstice gift. This columnist's commentary uses the holiday gifting season as a launching point for an endorsement of the community's efforts to become more bicycling friendly. 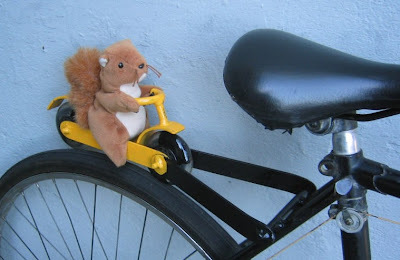 Two species proliferate on the campus of UC Davis where I work: bicyclists and squirrels (sciuridae griseus). This is not always a healthy mix. For the most part, my encounters with squirrels have been relatively trouble free. They loiter on the bike paths, but generally zip off when a bike approaches. Not last Thursday. I was tooling along when a squirrel dashed toward the bike path, paused, then made a quick dart right under my rear wheel. I could feel the bump, as if I'd ridden over a small stone. I stopped and looked back, and no squirrel. It had managed to scamper off somehow. So my question to readers who might be biologists or zoologically inclined: How guilty should I feel as an animal-loving vegetarian bike commuter? Did this critter sustain fatal injuries? Darwinian natural selection at work? Should I feel lucky it wasn't worse? If it matters, I weigh, well, let's say north of 200 pounds and was riding a touring bike with 38 mm tires. An increasing number of cities, large and small, welcome bicycling as an energy efficient, healthy and economically sustainable means of alternative transportation. Chicago, for example, is currently implementing its Bike 2015 Plan, which makes bicycling an integral part of the city's daily life through infrastructure projects, programs and policies. Likewise, a bicycle master plan underway in Portland is upholding and expanding its reputation as the most bicycle-friendly city in America. In contrast, Miami is choosing not to compete. To date, locating a sidewalk bike rack is more difficult than securing a Saturday night parking spot...On-street bike lanes simply do not exist. Nor do street signs directing motorists to share the road with their two-wheel "subordinates." Cyclists do not have a bicycle sharing program to look forward to, or even a simple bike map showing them the friendliest streets on which to travel. What's worse, there seems to be surprisingly little commitment by the city to improve the situation on any level. This runs counter to America's most vibrant cities like Chicago, Portland, Seattle, San Francisco and even our own Miami Beach, where an official citywide bicycle master plan is currently adding signage, bicycle racks and bicycle lanes with great success. While cyclists in much of the U.S. are shivering and busy with snow shovels, from sunny Florida comes this impassioned cri de coeur from a bike planner and advocate in Miami. I live in West Hartford Center, three miles and change from my office, hardly an Armstrongian tour. I biked to the office for a week in early October. For the most part, it was fun. I love the idea of getting exercise while getting to work, and leaving a car in the driveway. I would do it more often if it were just a bit safer. The one logistical challenge to biking to work involves access to a shower. Companies that had the wherewithal could be helpful to bike commuters by providing showers and lockers, bike racks and loaner cars for appointments or interviews during the day. Interesting first-person account by columnist in Connecticut's largest city, where bicycle commuting is presently at a low level. Image: Hartford Courant. Bicyclists in Hartford. Woodland to Davis via bike road? 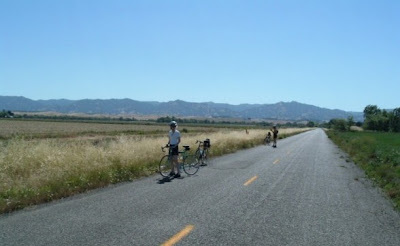 Each week, hundreds of bicyclists ride through the farmland of Yolo County on rural byways that connect the cities of Woodland and Davis. Some bike for pleasure. Others commute to work or school. All share the danger of being hit by cars and trucks that blow past them at highway speeds on narrow county roads. In October that danger became a reality when 60-year-old Woodland bicyclist Francisco "Willie" Lopez was struck and killed by a car on County Road 99 during his daily ride to work at UC Davis. Davis is already widely acknowledged as having the most bicycling-friendly streets in the U.S. The roads outside Davis? Not so much. Fairly standard rural roads in California, i.e. freeway speed traffic on two-lane thoroughfares. In the wake of a tragic incident, some Yolo County leaders are pushing for improvements to better accommodate bicycling commuters between Davis and its neighbor seven miles to the north, Woodland. The article suggests there are more than 1,300 people presently commuting between the two communities, which are separated by a mere 30-40 minutes of pedaling over flat terrain. 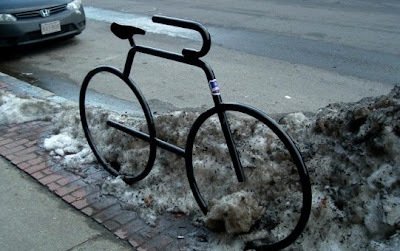 And many who now drive might bike, if only conditions were more appealing. Image: Paul Dorn. Rural road in Yolo County near Davis. Visit: Editorial: Fear Factor, Sacramento Bee. Kudos to the great folks at Chico Velo, who produced this great public service announcement, slapping motorists while pitching bicycling. Chico, California is great bicycling town, and Chico Velo sponsors one of California's most popular annual century rides, the Wildflower Century. Dave Duffield has been a bicycle enthusiast for the last 35 years. It was at that time, in Grosse Pointe, that two of his teachers made the conscious decision to offer youngsters an alternative to the run-of-the-mill sporting activities. Today, as an adult, bike riding remains an important part of Duffield's life, as he routinely opts for the two-wheel form of transportation as he travels to and from work...Duffield takes the I-275 nonmotorized pathway to work as often as Mother Nature will allow. As a way to promote usage of the path, Duffield, members of the Friends of the I-275 Bike Path group and members of the Michigan Trails & Greenways Alliance (MTGA) hosted an informational session last night on the work underway by the Michigan Department of Transportation (MDOT) to plan the renovation of the I-275 Bikeway and new connections to it. "Having ridden my bike for so many years and coming from a family that believes in giving back to the community, I felt (establishing the group) was something I would not only believe in, but something I used myself to commute to work on," Duffield said. Recreational bike paths inevitably become important travel corridors for bicycling commuters. And, as this article illustrates, these commuters often become the best advocates for path enhancements. Image: Observer & Eccentric. Bike commuter Dave Duffield. When Champaign resident Rick Langlois heads out the door for his morning commute to the University of Illinois, he doesn't turn the ignition to his vehicle. He starts pedaling. 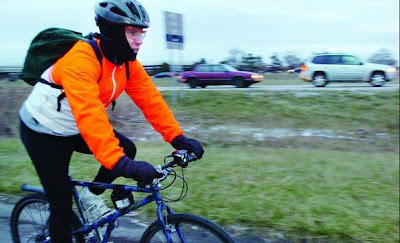 Langlois is one of the hundreds of local residents who commute to work each day by bicycle. And he's thrilled that the city of Champaign, in its new draft transportation plan, Champaign Moving Forward, is putting an increased emphasis on making the city bicycle-friendly. "I think it's a good start," Langlois said. "It's really great to work with city and county planners who are recognizing biking as a solution to a lot of problems...This is happening all over the country." Among the elements of the bike planning for this important university community: sharrows, development of a bike route network, and developer regulations requiring bike facilities. 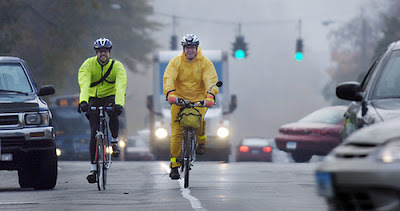 Image: ChampaignCountyBikes.org. 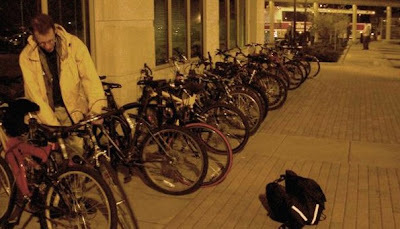 Bike parking at Illinois Terminal Building. The "thingy" is a velomobile, a ground-hugging, three-wheeled horizontal bicycle, sheathed in fibreglass. About three metres long, it looks like a miniature race car, but it's powered by pedalling. It has a steering bar, 27 gears, turn signals, lights and a speedometer. 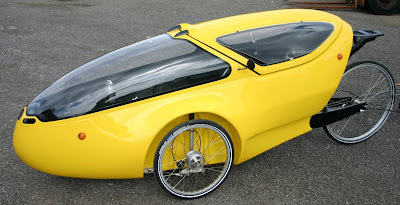 A cyclist who watched the velomobile skim by...said longingly, "I want one." While its aerodynamic form allows for speed--Mickevicius easily cruises at 40 km/h or more--its protective shell may offer a solution to the problem of cycling in Toronto when the weather turns foul. Over the years, recumbent enthusiasts have wondered why they haven't gotten more love. I'm among those who may have neglected 'bents, never having had one. But this article from Toronto demonstrates the benefits of enclosed recumbents, especially in colder regions such as Canada. With their cost, novelty, and weight, velomobiles may never attract more than the most serious human-power enthusiasts. But there are certainly appealing aspects of such machines.